Are battles between mutants and martial artists just not enough for you? Then you're in luck, as MvC3 will also feature a pair of gods. 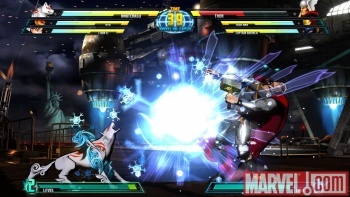 Images accidently posted to a gallery on the official Marvel website has revealed that as well as the four characters announced yesterday, the mighty Thor and Okami's Amaterasu are joining the fray in Marvel vs. Capcom 3. The images have since been removed, but the NeoGAF forums managed to save them all before they were taken down. The appearance of Amaterasu is probably going to cause a few eyebrows to raise, as she's not a character that would immediately spring to mind for a game like Marvel vs. Capcom 3, but the pictures show that she's more than capable of holding her own against the thunder god. Speaking at E3, Capcom's John Diamonon said that there would be over 30 characters in the game, and Thor and Amaterasu, along with the four from yesterday, take the total up to 16. Exactly who will make up the other half of the game's roster is the source of much speculation amongst fighting fans. Characters like Ken and Spider-Man seem like pretty safe bets, but Amaterasu proves that Capcom isn't afraid to throw a few curveballs too.